Campey Turf Care Systems supply the Tru Turf RS48-11C Golf Greens Roller, a premier Roll ‘n’ Spike Golf Green Roller. Listed below is a small selection of the Tru Turf range, please get in touch to find out more about the full range available from Campey, simply call +44 (0)1260 224568 or email us today. The versatile RS48-11E incorporates all Tru-Turf’s industry leading features and in addition, productivity is increased with 12v LED lights for early morning or late night runs. 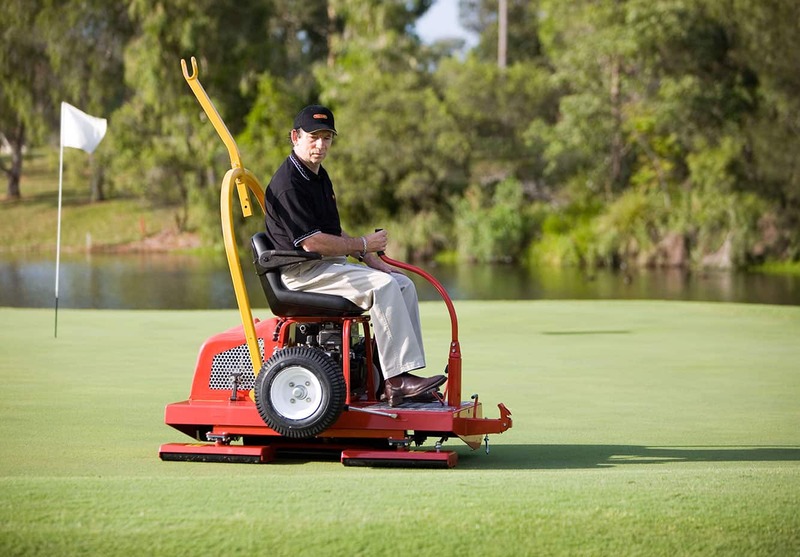 A slicer is also fitted as standard to help eliminate dry spots, remove excess water from greens and increases oxygen levels in the soil. Work load can also be simplified with optional sweeper and multi pin spiker attachments. Tru-Turf’s gasoline golf greens rollers have a power-train designed to handle the toughest operating conditions, utilizing a Honda 6.5HP OHV engine with lighting coil, coupled to a heavy duty Eaton 11 Hydrostatic transmission, stainless steel oil reservoir and heavy duty, low oil pressure steel lines. The patented 2×24″ totalling 48″ wide tri-roller smoothing heads are fitted with heavy duty smoothing rollers that are double sealed and fitted with quality ball bearings for longer life. A balanced roller produces an evenly rolled turf surface and it’s no coincidence just how well balanced Tru-Turf rollers are. The designed-in low centre of gravity ensures roller stability and operator safety. The unique and easily operated, built in trailer includes heavy duty axles and trailer arms. When combined with the rugged but lightweight features of Tru-Turf greens rollers, they are ready to take on the world’s most demanding courses and competitors. Tru-Turf greens rollers are used extensively on the PGA TOUR, Champions TOUR and Nationwide TOUR events.